It is well recognized that soil nutrient content varies across the landscape, but the nature and degree of that variability with respect to landscape position is still poorly understood and documented. Slope steepness and aspect, climate and land management are known to affect soil nutrient distribution in a field, but the relative and cumulative strengths of these effects are less well investigated. Four hundred and thirty-five topsoil samples collected from a typical Mollisol under intensive crop management in Northeast China were used to analyze the influence of landscape position, climate and land management on the spatial variability of soil organic matter (SOM), total nitrogen (TN) and total phosphorus (TP). Both geo-statistics and traditional statistics were used to analyze the data, and significant spatial variability was found for SOM (22.5–86.6 g kg−1), TN (0.98–4.26 g kg−1) and TP (0.26–1.80 g kg−1). The distribution of all 3 nutrients was found to be influenced by human activity and by landscape. When both slope degree and slope aspect were considered, the results differed from when only aspect or steepness was considered independently. In a northern aspect, SOM and TN were significantly higher on slopes of 0–2% than on steeper slopes, in a south-eastern aspect they were significantly higher on slopes of 0–2, 2–3 and 3–4% than on slopes >4% and in a south-western aspect those nutrients on slopes of 2–4% were significantly higher than on slopes of >5%. 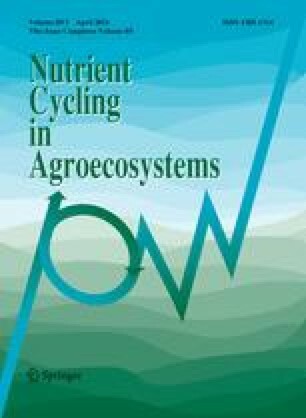 Cross-slope tillage effectively increased SOM, TN and TP by 33.8, 23.3 and 22.4%, respectively compared to down-slope tillage, indicating the potential for adoption of a nutrient-retaining management practice in the Mollisol region of northeast China. The authors sincerely thank the Project of Heilongjiang Science Fund for Distinguished Young Scholars and National High-tech R&D National Natural Science Foundation Program of China for partial support of this research, under grant numbers Jc200718 and 2008AA10z212.